As a kid, I ate of lot of chicken noodle soup in all its canned permutations: basic chicken noodle, deluxe chicken noodle (with more vegetables), alphabet chicken noodle, chicken with stars, etc. When I was older, I'd fix it as a snack from a packet of dehydrated soup. It was good! (at the time.) Probably very salty and, looking back, not very interesting. You can do much better by making some yourself. It's a pretty basic soup that can be made with egg noodles, chicken, onion, carrots, celery and broth. Once you've got that down, go a step further and make it from scratch. 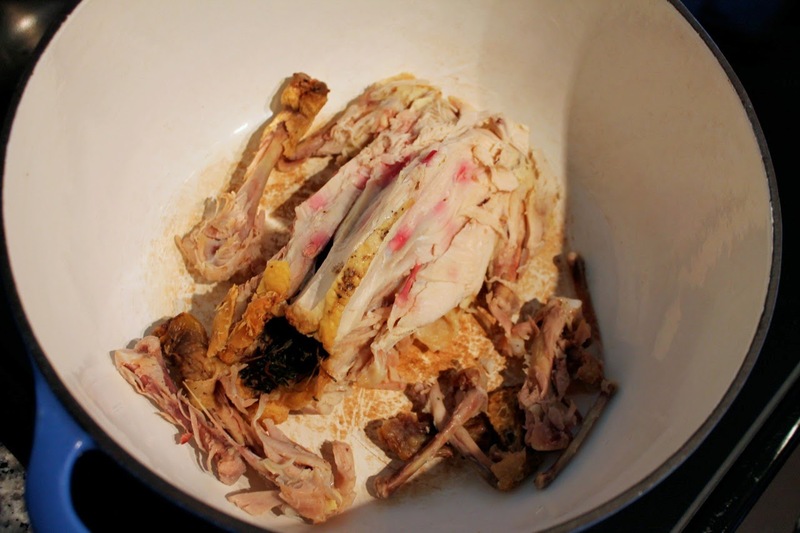 Having roasted a chicken recently, I had the meaty leftover carcass for making chicken stock. Everyone swears that homemade stock is better than store-bought. But, of course, you need the time and a pile of meat chicken bones on hand to make it. In addition to chicken, you can flavor the stock with any variety of vegetables. Onion, carrots and celery are pretty traditional, and I wouldn't skip out on those, as they each provide a different flavor component: sweetness from carrots, bitterness from celery and richness from onions. If you have fennel on hand, which I did, that's also a good addition. 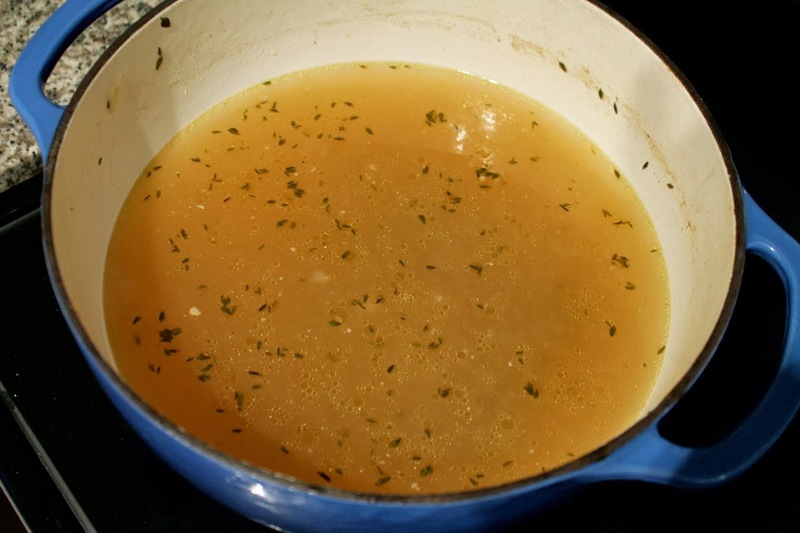 You can simmer a stock for a long time, but I did mine for just a couple hours, which was enough time for flavor to develop. 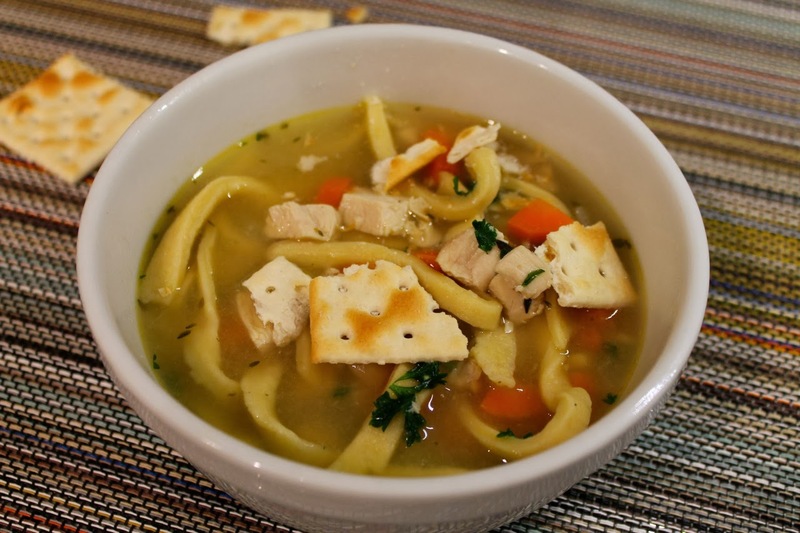 As homemade chicken noodle soups go, I'm not breaking the mold with this one. A quick search will net you many similar recipes. My goal was something that didn't take all day--just an afternoon. A couple of recipes I consulted and found most helpful were those by The Pioneer Woman and Ksaza. The noodles are my favorite part of this recipe. I love how thick and chewy they are--so much more substantial than noodles in a canned soup. My grandmother sometimes made chicken noodle soup noodles from scratch, and I thought they were so good. Be sure you don't make the noodles too thick. I cut mine with a pizza wheel. They're pretty rustic and I love that. Carcass and bones of a roasted chicken, about 1 lb. 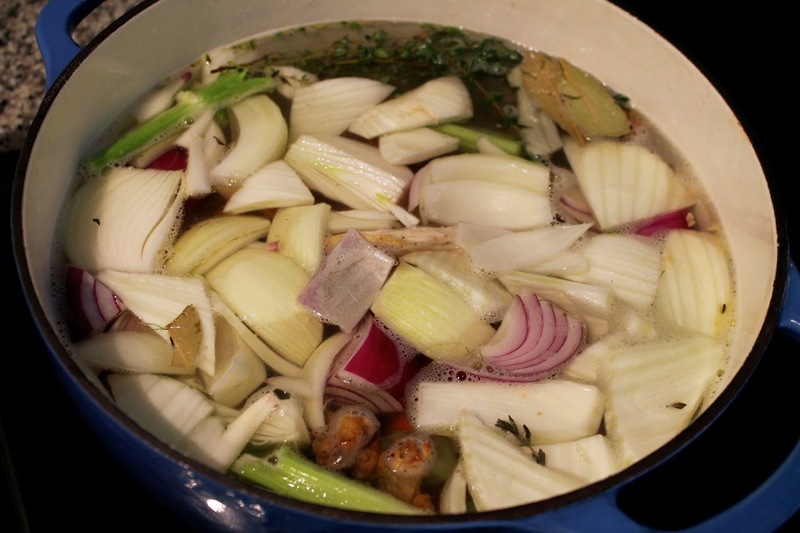 Combine chicken carcass and bones, water, salt, carrots, celery, onion, fennel (if using), bay leaves, them and peppercorns in a large stockpot or Dutch oven. Bring to a boil over medium-high heat, then reduce heat to medium-low to simmer. Simmer covered for 2 hours. Strain out and discard the chicken parts and vegetables (don't worry about getting it perfectly strained). Combine the flour and salt in the bowl of a stand mixer fitted with the dough hook. Turn the machine on the second lowest setting and add the eggs one at a time then the water 1 tablespoon at a time until the dough clumps together. Remove the dough from the mixer and transfer to a floured work surface. Using your hands, knead the dough a few times until the dough forms a consistent mass. Divide the dough into six pieces. 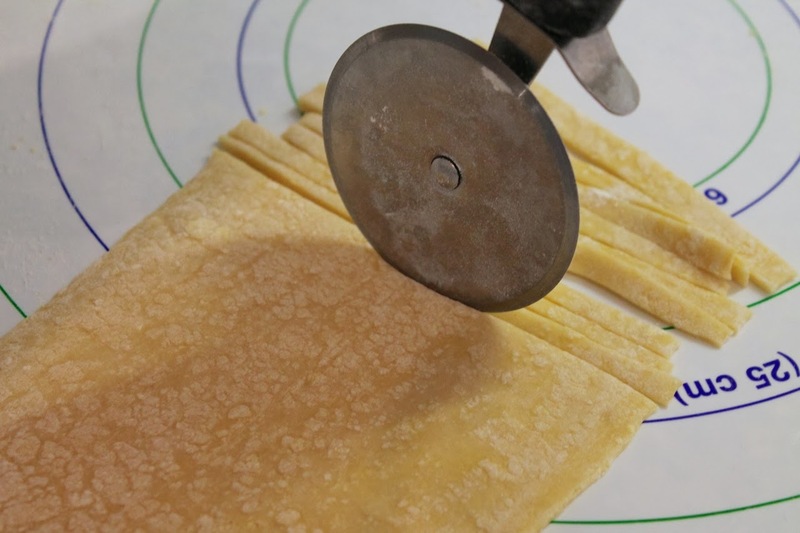 Working one a time, roll the dough out to 1/8-inch thickness then cut into strips 1/4-inch wide and about 4 to 6 inches long (I used a pizza wheel to do this). Set aside on a floured baking sheet to dry out. Bring the chicken stock to boil. Add the chicken breasts, reduce heat to medium, and simmer until the breasts are cooked through, about 25 minutes. Remove from the pot, transfer to a cutting board and shred or chop into 1/2-inch cubes. Add carrots, celery and onion to pot. Cook for 10 minutes at a medium simmer. Return chicken to pot during the simmer. Add noodles and increase heat to medium-high. Cook for 10 minutes. Turn off the heat. Stir in the parsley. Love them noodles. Thanks for making this! You're welcome. I've been wanting to try this for some time. These noodles were awesome! My husband and I have been eating this for days (he's sick) and loving it. I did my own thing with the soup (thigh meat, lots of dill, Penzey's bicentennial seasoning on the chicken). 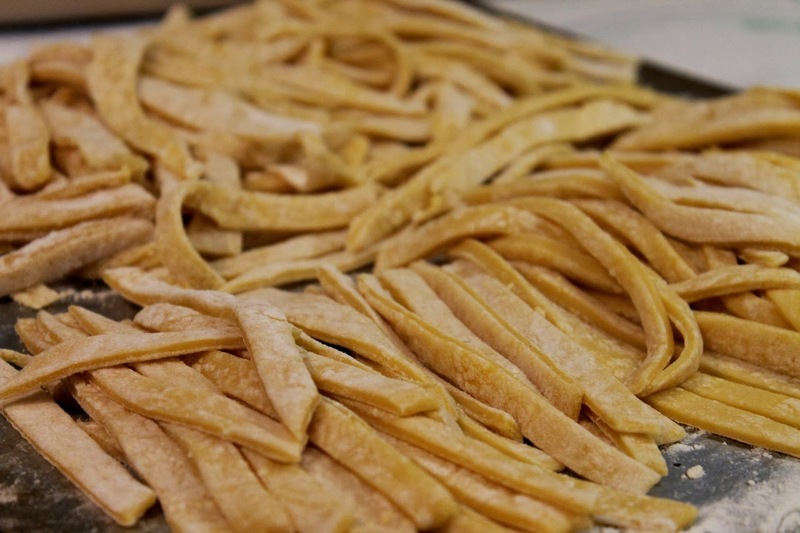 And I probably should have cut the noodles a bit thinner (I didn't pay very close attention to the size). In general, huge hit! I'm so glad you liked it! And I love how you changed up the flavors. I know what you mean about cutting the noodles a little smaller. I felt that way too when I made it, but I also thought there was something rather fun about having super-thick noodles in the soup. Hope your husband is feeling better.